In May of 2014 the City of Ottawa released it’s new Air Quality and Climate Change Plan. At the time Ecology Ottawa welcomed the plan after a decade of neglect of the previous version of the plan, although we noted that the greenhouse gas reduction targets were not very ambitious. In May of 2015 the Ontario government announced its 2030 greenhouse gas reduction target. Comparing the two targets it’s clear that the City of Ottawa has to up its game if it is to support the provincial goal. The city’s climate plan aims to reduce emissions by 20% per capita by 2024 based on a 2012 baseline. According to the plan’s calculations the expected growth in population in the city means that a 20% per capita reduction equates to a 12% absolute reduction in greenhouse gas emissions. The province’s recent announcement puts its 2030 target right in line with its 2050 target. That 80% reduction target matches a commitment by G8 countries made back in 2009. 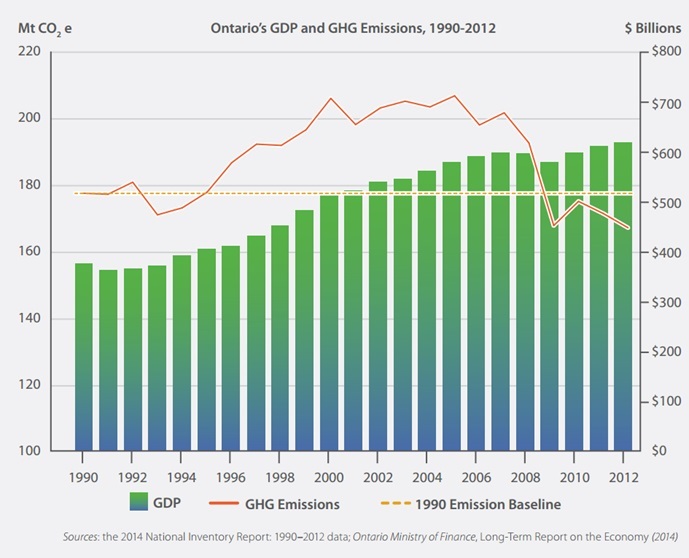 This linear relationship of Ontario’s targets for 2020, 2030 and 2050 imply that by 2024 Ontario hopes to see an approximate 24% reduction in provincial greenhouse gas emissions. At first glance this appears to mean that Ontario’s target is twice as ambitious as the City of Ottawa’s. Certainly the province will have a tough time achieving its targets if its major cities are not achieving similar reductions. But it’s worth a second look at the appearance of our city’s comparison. Ontario’s target is based on the internationally recognized comparison year of 1990. 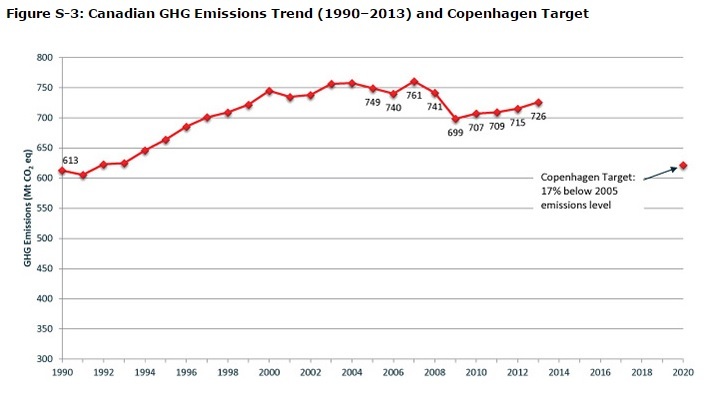 The City of Ottawa doesn’t have data back to 1990 to know what it’s emissions were. If Ottawa’s emissions in 2012 were higher than they had been in 1990 then the comparison would actually mean that our city’s reduction targets were even less than half as ambitious as the province’s. It is possible that they were higher in 2012 if they followed the Canadian average as this chart from Environment Canada shows. If, however, Ottawa’s emissions in 2012 were lower than they had been in 1990 the comparison would mean Ottawa’s targets weren’t quite so weak. Again, it is possible that they were lower if they followed the Ontario average as shown in this chart from Ontario’s Ministry of Environment and Climate Change. Because the data does not exist for our city back from 1990 it is impossible to know which way might be true. The Canadian overall increase 1990 to 2012 is a larger percentage (very roughly 16% more) than the Ontario decrease over the same period (very roughly 6% less). But we don’t know how much either of these overall averages is representative of the City of Ottawa specifically. It seems reasonable for the purposes of this comparison to assume Ottawa’s 1990 emissions were roughly equivalent to those in 2012. Whatever the case, if the city target isn’t exactly half of the province’s it is still significantly less ambitious.